RUMBER Custom Trailer Bumper 8' or up to 96"
Home > Bumpers > RUMBER Horse Trailer Bumpers > RUMBER Custom Trailer Bumper 8' or up to 96"
Manufactured by RUMBER Materials, Inc.
for a better grip for horse's hooves. This product has a concave back, and must have enough room so that both the top & bottom edges fit flat against the trailer 3 1/4". 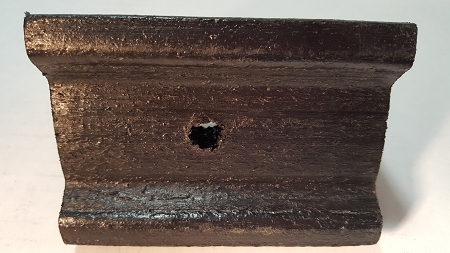 The bolt holes are counter-sunk 7/8", for safety. Use 3/8" bolts with a 1' wide washer. Custom Bumpers measuring up to 84" are the 7' price. Bumper lengths measuring over 84" are the 8' price. your bumper is "split", an you will just be charged for the total number of inches, either the 7' price or the 8' price. 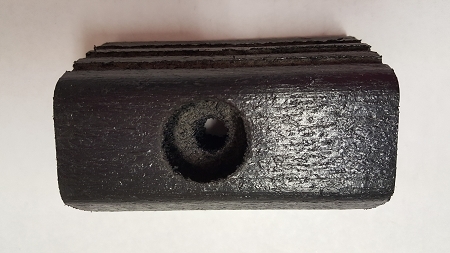 Each trailer bumper is custom cut to the exact length by the fraction of an inch that you specify, and the bolt hole centers are drilled exactly where you specify. centers should be placed, starting from the LEFT, facing the back of the trailer. **Measure carefully--no returns on custom cut items. for shipping a Oversize or Overweight OR Very Long item by ground. Rope Hook, Steel Screw-On, 3"